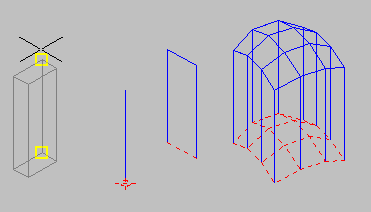 polylines to polygon meshes, and open polygon meshes to groups of open polygon meshes. The displacement gets specified like in the "move", "copy", and "stretch" commands. Original points, lines, 3D faces, and polylines will be erased if the "delobj" system variable equals 1. Objects on locked layers do not get lifted. Bulges of polylines are ignored (as if the arc segments were straightened; vertices connected directly by line segments). If the original is a polygon mesh, the LIFT function will create five new meshes serving as "top" and "side" faces. These meshes are combined to a group (cf. AutoCAD "group" command; not supported by IntelliCAD). The name of the group begins with "LIFT" and contains date and time of its creation. Either all normals are pointing outward or all normals are pointing inward (provided that there are no self-intersecting faces or meshes).